Buffalo Technology provides a wide range of NAS solutions for personal, home and small office use. These devices offer space-efficient shared data storage with access over a local network. Unfortunately, despite enhanced reliability of modern Network Attached Storages, they still remain exposed to failures and data loss. This article describes methods of data recovery from popular LinkStation and TeraStation Duo NAS solutions of Bufallo Technology using UFS Explorer RAID Recovery. Warning! The instructions below assume that you have basic skills of manipulating hard drives. Any physical damages to the storage media may cause permanent data loss. If you are not completely sure about your competence in working with hardware, please, turn to professional data recovery services. Attention! This article contains details about the state of NAS after its resetting to factory defaults. Please read the article carefully for information about data recovery from a failed device after its resetting. Accidental deletion of important information due to user mistakes. Data recovery chances from NAS depend on the NAS model and the causes of data loss. Recover the lost information with any of the UFS Explorer Standard Recovery or Raise Data Recovery – XFS Support software products. For efficient data recovery from NAS SysDev Laboratories advise their UFS Explorer software. 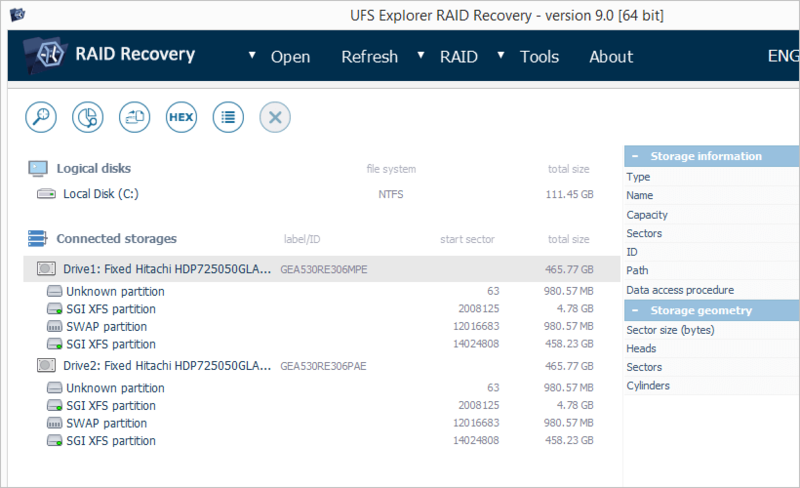 UFS Explorer RAID Recovery is specially created to work with complex RAID systems. UFS Explorer Professional Recovery offers professional approach to the process of data recovery. This software features embedded tools for data recovery from RAID. Other UFS Explorer products work with RAID systems via plug-in modules. Each of the software solutions applies powerful mechanisms allowing you to achieve maximum recovery result and is 100% reliable, guaranteeing complete safety of the data stored on your NAS. For more detailed information please visit https://www.ufsexplorer.com/products.php. For RAID1 (mirror) – at least one of the drives is operable. Connect the drives to a PC. When the NAS drives are successfully connected to a PC, you can start data recovery. The extended partition (a partition with sub-partitions) is a container and will not be mentioned further on. Note: Depending on the retailer and the model NAS can contain from two and up to four partitions on each drive. Data partition is the largest one (takes up 95-99% of the entire disk space) and has no sub-partitions. For RAID1 a valid XFS file system appears on the data partition of each NAS drive. For SPAN or RAID0 the first drive contains 'SGI XFS' on the data partition and the second one contains 'Raw partition'. Step 1. Connect both drives to a PC. c) you can't find some of the files available on the device after data loss. – connect both drives for further diagnostics. NAS is configured to RAID1 (mirror). The file system is readable on both drives. Data recovery is possible from any of the drives. The file system seems to be destroyed or NAS worked as iSCSI target. In this case your NAS requires professional data analysis and data recovery services. NAS was configured to RAID0 (the default configuration) or SPAN. The drive with the SGI XFS file system will be referred to as 'first' and the one with a RAW partition – as 'second'. Explanations as to further analysis you will find in Step 3. After analysis you can start data recovery from any of the RAID1 drives. If you fail to recover your data, please, use professional data analysis and data recovery services. NAS was configured to RAID0. If you run a scan for at least partial file system reconstruction, you'll get a more precise result. If the recovered files have valid contents, it is a JBOD or RAID1 configuration, if file contents are invalid, this is RAID0. The SPAN configuration on TeraStation and LinkStation products doesn't fit to the data partition and cannot be aligned without the knowledge of the XFS file system or professional analysis. The stripe size is invalid. Open the RAID configuration and adjust the stripe size. the RAID configuration was successfully assembled and you can proceed to data recovery. your NAS storage seems to be reset to the default configuration state. The RAID1 configuration allows for data recovery from one of its drives. The SPAN configuration requires professional assistance of a data recovery specialist. The RAID0 configuration requires analysis and reconstruction. The device was reset to factory defaults. NAS re-configuration. After re-configuration of NAS storage the lost data remains recoverable. You should assemble the storage as described in the instructions of Step 4. All good files emerge in the 'share' folder of the Virtual RAID. If you don't find the files, scan the Virtual RAID for lost information. If the previous configuration was set as "maximum speed and capacity" and the drives weren't swapped before resetting, the file system of NAS was formatted. To recover the lost information run 'Data Recovery' scan enabling the 'File system reconstruction' option. If the drives were swapped before NAS resetting, rebuild RAID as described in Step 4 but with the reverse order of drives. As a result you will get Virtual RAID with a RAW To recover the lost information run 'Data Recovery' scan enabling the 'File system reconstruction' option. Original RAID1 (mirror)If the previous configuration was with half of full capacity and the redundant data sustained more serious damage as a new XFS file system was written with different parameters. Ordinary file system reconstruction cannot give expected results. Scan the second drive of NAS storage, the one with a RAW data partition. If this doesn't provide any positive result, it's recommended to use professional data recovery services. Original SPANThe file systems remain almost equal. To recover the data destroy invalid XFS superblocks produced with the RAID0 format. After this re-assemble RAID as SPAN and run file system reconstruction. Note that modification of disk structures and span aligning require knowledge of the XFS file system structures or professional data recovery assistance. NAS resetting destroys some of on-disk structures possibly resulting in some files, folders or file names permanent loss. It's recommended to analyze the entire tree of the "reconstructed file system" for files you are looking for. Some files and folders can appear under the "[Parent unknown]" virtual folder with numbers in file/folder names. In case of any physical damages it's strongly recommended to bring your NAS to a specialized data recovery laboratory in order to avoid data loss. If you feel unsure about conducting data recovery operations from your NAS by yourself or not confident about RAID configuration in your NAS, feel free to use professional services provided by SysDev Laboratories. For data recovery professionals SysDev Laboratories offer expert NAS storage analysis on a commercial basis.